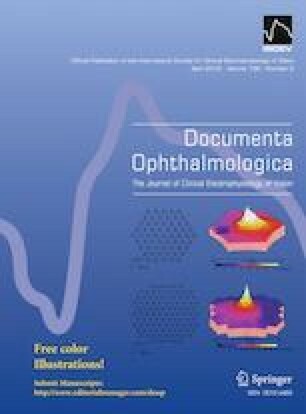 To investigate the relationship between adaptation time and the parameters of electroretinography (ERG) and pupillography in healthy subjects. Forty-six eyes of 23 healthy women (mean age 21.7 years) were enrolled. ERG and pupillography were tested in each of the right and left 23 eyes, respectively. ERG with a skin electrode was used to determine amplitude and implicit time by the records of rod-, flash-, cone-, and flicker-responses with white light (0.01–30 cd s/m2). Infrared pupillography was used to record the pupillary light reflex to 1-s stimulation of red light (100 cd/m2). Cone- and flicker- (rod-, flash- and pupil) responses were recorded after light (dark) adaptation at 1, 5, 10, 15, and 20 min. Amplitude (µV) was significantly different between 1 min and ≥ 5 or ≥ 10 min after adaptation in b-wave of cone- or rod-response, respectively. Implicit time (ms) differed significantly between 1 min and ≥ 5 min after adaptation with b-wave of cone- and rod-response. There were significant differences between 1 min and ≥ 10 or ≥ 5 min after dark adaptation in parameter of minimum pupil diameter (mm) or constriction rate (%), respectively. Cone-driven ERG can be recorded, even in 5 min of light adaptation time without any special light condition, whereas rod-driven ERG and pupillary response results can be obtained in 10 min or longer of dark adaptation time in complete darkness. The authors thank Yuuki Nakayama, Yousuke Horiuchi of Uni-hite corporation, for technical assistance with data collection; Robert E. Brandt, Founder, CEO, and CME, of MedEd Japan, for editing and formatting the manuscript. This study was supported by a grant from Kitasato University School of Allied Health Sciences Grant in-Aid for Research Project, Grant Number 2018-1041. All research procedures performed in this study were in accordance with the ethical standards of the institutional and/or national research committee and with the 1964 Helsinki declaration and its later amendments or comparable ethical standards. Informed consent was obtained from all subjects in this study.